At LCI we specialize in LED Halo Channel Letters. 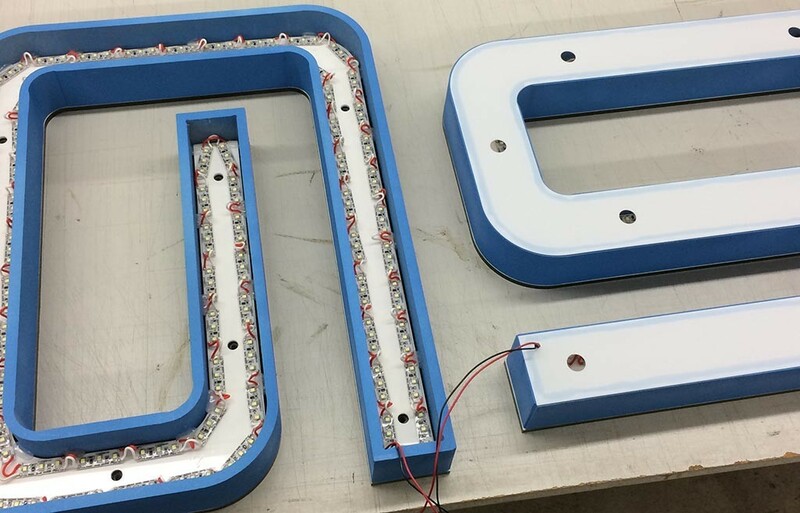 This image is of the back side of an LED Channel Letter; The letter housing is made of HDU Sign Foam which is painted to a custom Pantone color. The front side of the Letter is Acrylic which is also painted on the 2nd surface with the same color match. The white acrylic reflector layer helps to shoot light back towards the wall, creating the Halo effect. Then we supply you with a mounting template for fast and easy, do-it-yourself installation. For these LED Halo Channel Letters, we manufactured 1″ standoffs for spacing between the letter and the wall. All of the transformers and LED lights are low voltage and UL approved. Custom Acrylic and base layer color is available. 1. Do I need to supply LCI with a cad file to produce LED Halo Channel Letters? 6: Do we need to wire the letters to the transformer?? A: No. LCI will supply a plug and play lighting system. We use a system of jacks and plugs for quick and easy install.